There will also be another DC/DC stepup converter in the system as the valves in the harvester head also have 24V solenoids. Even if this requires another 12V to 24V stepup converter it might not be that bad thing as the current going to the head will be smaller than it would be with 12V solenoids so the requirements for the cable carrying power for all the valves to the head from the base machine are less. You can see that the result of the etching isn’t that good. This reminded me that after not using the developer and etching liquids for over a year it’s a good idea to make new liquids instead of just using the old. But even if there were some difficulties the result seems to be working. The inductor used for the converter feeding the harvester head is different one than in the photo though. 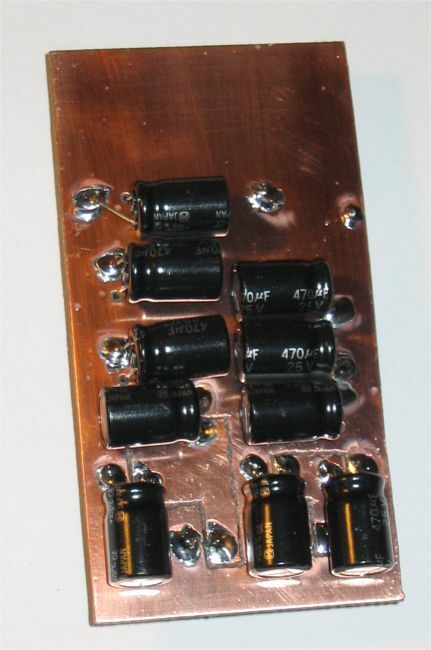 Electrolytic capacitors were moved to the backside to make it easier to solder them on the board. A new DC/DC converter using a modern two phase controller IC is also under work. But looks like it’s not needed for this application yet as the above converter seems to be handling the current requirements of the harvester head just fine. 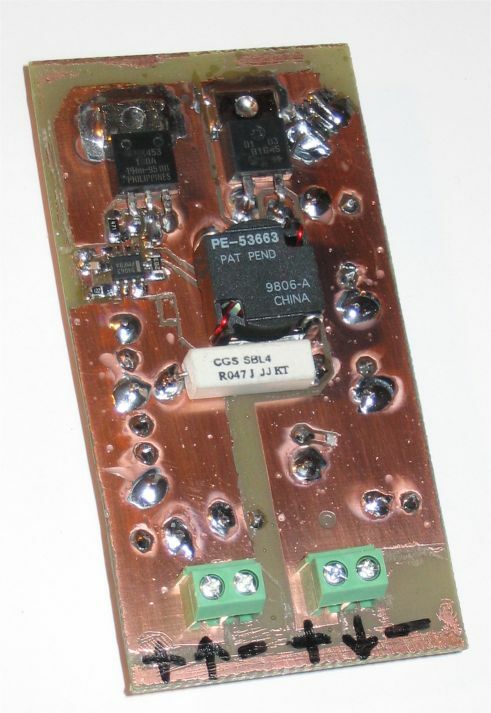 And the parts for this converter were found from existing supplies which is not something that can be said about a converter using a modern controller IC, very low RDSon FETs and high performance inductors. This entry was posted on Sunday, January 7th, 2007 at 21:52	and is filed under Harvester head. You can follow any responses to this entry through the RSS 2.0 feed. You can leave a response, or trackback from your own site.